‘Form is temporary, class is permanent’ might just be the most overused phrase in sport writing, but players like Roger Federer make it ever-relevant. The final of the Australian Open 2017 probably was the biggest event in modern (or all-time) tennis history. How could it not be? Two giant forces of the game not only clashed against each other but also brought along Herculean legacies with them to transgress time itself. 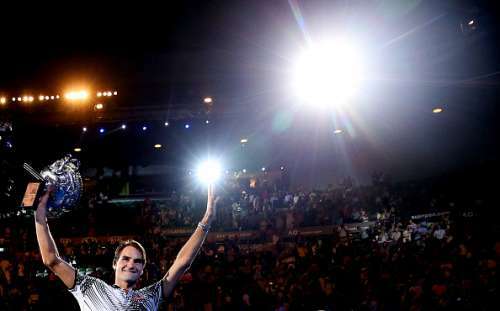 At the end of it all, it was Federer who outlasted the resilience of Rafael Nadal to clinch his 5th title at Melbourne. The Swiss maestro rewrote history with this achievement, continuing to belie his age. He transformed the “Bel18ve” slogan from an indulgent fantasy to a drool-worthy fact. He truly has taken a giant stride towards the ‘GOAT’ or ‘Greatest of All Time’ appellation now; his numbers tower over those of his contemporaries as well as his predecessors in a daunting and dangerous fashion. It seems like the 18-time Grand Slam winner has ticked off all boxes of accomplishment in his area of expertise. But can we really dare to be this presumptuous about a man like him – someone who has a zeal of steel? With the roaring comeback that he has made, Federer has a strong chance of achieving even more – in this season itself. Now that he has nothing to lose, numerous opportunities will pull at his racket strings consistently; he will go into tournaments with all guns and rackets blazing, and leave no stone unturned. Roger Federer already has 89 singles career titles to his name, and is at the top of the pile among his contemporaries. Next on the list of current players are Rafael Nadal and Novak Djokovic, with 69 and 67 titles respectively. This shows that a mammoth gap of at least 20 titles separates the Swiss from those closest to him in the list! Federer is no longer a nobleman – he’s a king now. The kind of king who does not need to invade alien castles, but the kind who would rather build a buttress for his fortress. His huge title lead is his fortress today – he must look to preserve and protract it as much as possible. With 89 titles spanning over 17 pro years, the 35-year-old has an average of 5.2 titles per season. If he keeps going down the same road, winning 95 tournaments before he hangs up his boots is a strong possibility. He also has 137 finals to add to his prestigious titles, which will surely go down as one of his most gigantic achievements. Federer is consistently adapting to the changes in the game and going toe-to-toe with the best in the business today. That is what will help him pursue more ATP championships and augment the grandeur of his trophy cabinet even further. If 95 is a strong possibility, maybe dreaming of 100 is not that far-fetched?